Well, to be clear.... some of us just don't like that the choice of heir really never mattered. We can still be a clan, we might not be an accepted clan however, so there is that. We were a clan long before the Empress decreed the Spider were an official Great Clan. If we lost acceptance in the Empire.... but got back our Onyx and Obsidian champions (and not have the other 9 clans combined work to get rid of our unique titles)..... and we have a special clause for if/when a Spider wins on every Kotei..... than i will be ecstatic. There will still be a CCG/Story power level disconnect though. Honestly, the end of Samurai Edition should have just seen the Spider Clan hollowing out the imperial bureaucracy and placing Daigotsu on the Throne (to be later succeeded by Kanpeki). It would have created a moral disconnect between the Empire and the rest of the clans that would justify any future tensions, including during the Destroyer War, where the interests of the clans and Rokugan were placed directly at odds. It might have also meant roninizing the Seppun, Otomo and Miya families (or killing them), which would have been interesting and satisfying. “Looks like Buttlord is high on all of the drugs. Just letting the bad guys win without any input from the players?” Yes. What the hell is the point of including villains as a standard part of the setting if all of their goals are contingent on tournament success and thus foiled by literally any non-Spider win? If they are the powers that be, they can play both the role of a villain during peace time while also showing up to wreck face against external threats. I hope next arc is just the Spider Clan killing and eating the imperials. They story was a great read. And I won't jump into a bandwagon jump just yet. But it does push me to look more at other options as I've always loved the bad guys but not the mindless ones. I won't respond to all the commentary on this because, quite honestly, some of it is quite kneejerk and reactionary. - Just because some in the Spider may or may not turn to the Taint does not mean they all do. - While the general outline of every clan is written, they are all malleable. - Winter Court decisions DO matter. You have already seen some of them in fiction. Others take time. We are still playing catch up and do not yet have enough "back logged" to push them out once a week. - Saying that your choice of Emperor or your decisions in Winter Court didn't matter are...well, silly. You will see how they matter, but we can't just tell you. - Neither AEG in general or the Story Team in particular is "throwing away" any options we have put on the table. - Villains can be great with or without the Taint. I mean, your clan founder was quite Tainted when he accomplished many of his most remarkable goals and considered the Taint a true blessing, not a curse. - A Kakita daimyo who cannot duel would be Kakita Yoshi. Please, take a bit and step back. Be calm. Be cool. Do not jump to reactionary conclusions no matter what you perceive in past experiences. I wouldn't even post here if I didn't think you will find enjoyment (all of you) in the upcoming portions of the story. As for anything leaked always remember that what you have seen is not the whole picture. Otherwise, please do not bring it up. Dont worry mate, any raging we do is mostly directed at results and plans put into place before you hopped on board. 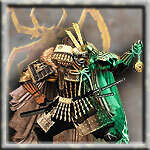 The Spider forums, like the burning fires of Jigoku itself, need to burn for a bit after anything is throne into there. Remember that there are about 50/50 split between pro-clan players and Hoards players as far as I can tell and they clash A LOT during times of great tension. Its only going get louder and crazy but hey, at least it shows we care. I mean goodness, I think spider has been the most active clan forum in the past few months, at least since twenty festivals was revealed. Just keep pumping out fictions, dont worry, no matter what direction the story goes Spider players will always find areas they can cling too and charecters to follow as well as aspects they will dislike. Like my love of the Susumu yet aversion to the oni. We all know that something has to give and until we all know what that is... well there wont be any real security for Spider players yet. We aren't talking about leaks thankfully, but hopefully by July the story is clearer. My biggest hope is in the Story Paths that Dave brought forward. You want to see sparks (not you!) fly, wait until we get those and the debate begins over those. Spider is a faction that has scattered desires all over the place, we only really care for one thing, getting the Hantei on the throne and damning anything that tries to stop us, it binds us together and when things get crazy, we get crazy, when thing get good, we get good. Dont worry man, you guys have time to make this all work. We love your work and cant wait to see what you guys work on. Say work ONE MORE TIME, MOTH******ER!!!! AUDAX! SPARKS IS YELLING AT ME AGAIN! WAAAAHH! I think missing big parts of the picture is where the majority of the worry is coming from. A statement that can be construed as a half-truth. 8 great clans plus Naga starters in Onyx. What is now looking like a meaningless Devil's Choice on heir selection. The cloud of accusations surrounding WCIV. Saying one thing in the design dairies (being more open on the upcoming story) and the doing stuff that seems to be opposite that (still keeping secrets). All of this is making things worse. I know it's already been a while but just wait a liiiiiitle bit more guys. We've got a lot of information coming your way. The more I think about it, the more it makes sense to me that Kanpeki would want the taint. Sure he would be losing one of his most defining traits, but he likely sees it as a weapon to be exploited (much like the blood). i don't get "not tainted" as one of his "defining" traits, honestly. I get why Daigosu wanted it for his son. he wanted a chance for there to be a Daigotsu on the throne and if he was busy ruling Hell, the best chance for him to make that happen was for his son to be pure. But K was never about being pure. He was about being monsterously strong, trained by all aspects of his clan except the Chuda. As champion he has commanded tainted legions, worked with tainted shugenja. About the only thing with the taint he hasn't done is embraced it, and at this point Kanpeki seems to be operating under the assumption he won't even be serving the Empire soon, much less in a position to put one of his line on the throne. If that is what comes to pass, or he is sufficiently convinced thereof, it makes TOTAL sense for him to embrace what is, arguably, his birth-right: the taint that made his holy father the juggernaut that he was, and which has for generations define the culture he leads. 2) Kanpeki actually snapping an enemy samurai like a twig and his flavor text simply saying, " I'm BACK! *insert Rokugani equivalent of b&tches! *"
" I'm BACK! *insert Rokugani equivalent of b&tches! *"
Can we get an ETA to the big reveals? I wish to see what's in front of us before commenting in fear of sounding reactionary.